In 1928 the Equal Franchise Act was passed and, for the first time, all women (and men) over the age of 21 were eligible to vote. One year later the Townswomen’s Guild was formed with the aim of educating women about good citizenship – and to have fun! Last year Knowle Guild celebrated its 80th birthday and we are still being educated and informed – and still having fun! When planning our monthly meetings we look for speakers who will help us to fulfil these objectives. The Polish population in Knowle has increased significantly in recent years. Some of our members have Polish neighbours, we hear the language spoken at the bus stop and in the park and there are two Polish shops in the area. It seemed appropriate that we should get to know more about the people living amongst us. Having no connection with the Polish community I found a website for the Anglo-Polish Society and their first objective, “to promote good relations between local communities and Poles living in the area” was just what we wanted! 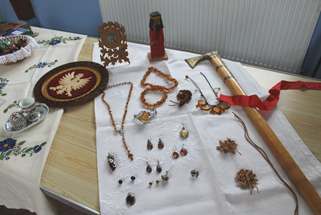 Some examples of the jewelry and other artifacts available for viewing. There followed a flurry of emails between myself, Chris and Grażynka as to what would be the most appropriate things to include in a 45 minute presentation. When Grażynka and Bożena arrived at our Guild meeting we knew we were in for a treat! From the interior of their car came an enormous array of national costumes, amber jewellery, leather goods, painted wooden eggs, wooden sculptures and pictures, guide books and cakes – lots of cakes! Before the presentation Chris gave a brief outline of the origins of the Anglo-Polish Society and gave details of a book published by the Society entitled “In War and Peace – Poles who came to the West Country”. It was lovely to see a photo of Grażynka’s parents on their wedding day and another one of Grażynka as a child included in the book. Grażynka introduced herself as “Polish on the inside and Bristolian on the outside” as she was born in Bristol to Polish parents. She had prepared a series of slides to illustrate her talk and they were very informative. Having given a brief history of Poland by Grażynka It became increasingly obvious why the Polish language and culture is so precious to her. For much of its history Poland has been fighting off invaders, and we were shocked to hear that in the late 18th century Poland was wiped off the face of the map and the land divided between Austria Prussia and Russia. The Anglo-Polish Society was formed in 1832 in support of a Polish uprising which was brutally put down by the Russians. The suffering of the Polish people during World War 2 was starkly illustrated using statistics and photographs. Whereas 0.7% of the UK population was killed, in Poland it was 20%. We saw a distressing photograph of a Polish civilian starving to death. The whole room gasped in horror. Having fought with the Allied troops many Polish personnel remained in Britain rather than return to a Communist regime. Grażynka explained that, throughout Polish history, the battle for freedom included the determination to keep the Polish customs and language alive and to excel in literature, art and science. We were reminded of the contribution of Copernicus and Marie Curie amongst others. A few Polish national costumes worn and on display. We were taken on an illustrated tour of Poland and saw interesting photos including that of the Wieliczka salt mine, an iconic brown bear and Warsaw before and after its reconstruction. Three of our members have visited Poland and many more would now like to go! 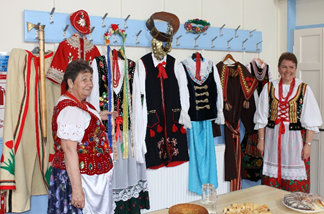 Grażynka finished her presentation by talking about the national costumes, typical crafts and the types of food to be found in Poland – and in our local Polish shops. After the talk we were able to have a closer look at the many items on display and Grażynka and Chris were on hand to answer any questions. The afternoon finished with a feast of Polish cakes for us to enjoy! Thank you all for the obvious effort you had put in to making this a memorable afternoon for us.